Every semester I give my infographics and visualization students a list of websites to look for inspiration and examples to critique or learn from. This is a challenge. Sure, I point out Marije Rooze's collection of graphics from The Guardian and The New York Times, but that doesn't give beginners an accurate impression of what we could call 'the varieties of visualization experience.' I also recommend VisualLoop's weekly posts, but those are a bit of a hodgepodge, as they mix the great with the slightly dubious. Robert Kosara's coming to the rescue. 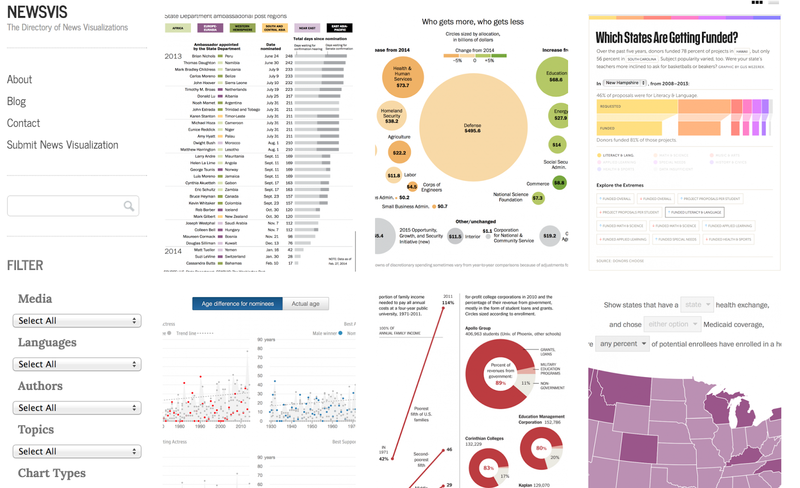 His recently launched NewsVis.org: The Directory of News Visualizations (Twitter) seems to be what I needed. As Robert himself has explained, the website will also be useful to find that wonderful scatter plot or slope graph you saw a few months ago but forgot to add to favorites. A gift from heaven for absent-minded professors!